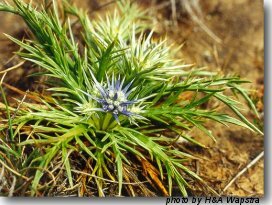 Annual herb, extremely prickly, with erect, rigid, much-branched stems. Widespread, usually inland, often in colonies. Flowering stems are often dried for use in floral arrangements. Suitable below powerlines. May be grown from seed, generally with good results.